Located in the heart of the Blue Ridge Mountains near the Blue Ridge Parkway in Laurel Springs, NC, Thistle Meadow Winery offers individualized tours of our family-owned winery. Our tastings include wines made from grapes grown around the world. We create a wide variety of red, white, and blush/sweet wines, ranging in taste from dry to sweet. 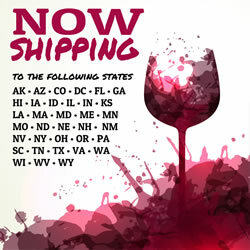 If you live in one of the 30+ states where our wine may be shipped, you may place your order online. Our award-winning wines are hand-crafted in small batches to ensure the highest quality. Just recently, we were ranked third among North Carolina wineries by the South Eastern Winery Review and scored a perfect "10" in friendliness. Our winery also offers unique wine accessories, Thistle Meadow Winery clothing, and gift certificates. We are closed on Easter Sunday, Thanksgiving, Christmas, and New Year's Day. We accept Visa, MasterCard, Discover, and American Express.